"So many things are touted as 'miracle foods' these days, but invariably you find out the claims were false and the benefits exaggerated. I sure hope that doesn't turn out to be the case with these grain-free, gluten-free, dairy-free, low-carb, low-cal, and quite delicious yuba noodles. So what's the catch? It's tofu." Whisk vegetable oil, vinegar, peanut butter, honey, ginger, chili sauce, soy sauce, and sesame oil together in a bowl until dressing is smooth and creamy. Toss yuba strips, cilantro, carrots, cabbage, and green onions together in a bowl. Pour about 1/2 of the dressing over the salad and stir to coat. Stir remaining dressing into salad until salad is dressed to your liking; top with black sesame seeds. 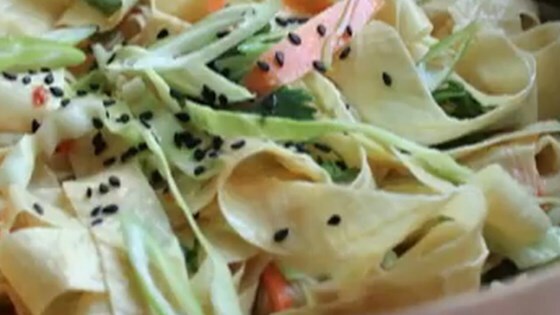 A yuba "noodle" and cabbage salad with a flavorful peanut dressing.